"Add any fruits, vegetables, nuts and spices that you desire." Preheat oven to 350 degrees F (175 degrees C). 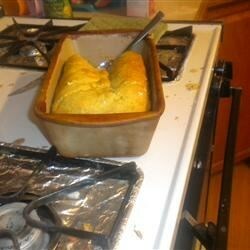 Grease one 4 1/2 x 8 1/2 inch loaf pan. Mix flour, baking powder, soda, salt, sugar, oil, eggs, apple, walnuts, and vanilla only until dry ingredients are moistened. Bake in greased 4 1/2 x 8 1/2 inch loaf pan at 350 degrees F (175 degrees C) for 35 to 40 minutes. One cup of any type shredded fruit or vegetable may be used in this recipe. Depending on what you use, you may need to add some water to the mixture. We suggest adding only 1 tablespoon at a time, just until ingredients are evenly moist. What did I do wrong? The bread came out very dense and hard. Is three cups the right amount of flour?? The taste was good, though. That's why I gave a good rating. I had the same problem as the first review. It came out very dry and heavy. I made mine with apples and cranberries. Should there be something added to give it more moistness? Simple recipe that takes barely any time or effort. I used bananas and it turned out great. turned out very dry and doughy. This recipe was ok, but I was not overly impressed. There's WAY too much flour; I had to add about 1/2 cup of milk to the batter to mix in all the flour. I don't think I'll try this one again. I added bananas as well. I should have mixed them in better but otherwise it was very good.